Wacky Men are the ultimate employee!! You pay for them only once and they work hard, drawing attention and driving business into your store. Wacky Men do not require Medical or any benefits and they never ask for a raise. Made from durable rip-stop nylon inflatables fly into action with the flick of a switch and continue their animated antics all day. Wacky Men will wave their arms and their tubular bodies gyrate demanding attention of anyone passing by your store. Wacky Men are customizable either by specific shape or more simply with print. Wacky Men are really affordable too, starting as low as $99.00 (puppet only). Like banners Wacky Men can be replaced, advertising specific events or sales since inflatables use a standard size and once you have invested in the fan the options are endless. 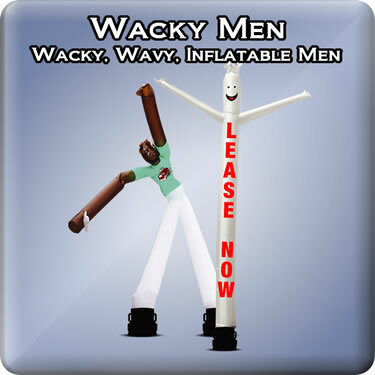 Create a fun and energetic atmosphere, that will lead to higher traffic and higher sales with Wacky Men!